All last week I worked diligently on my crazy quilt block. First step was to complete all the embroidery. This still left space for further embellishment. Next was to add lace appliques. I couldn't find small pieces, so I purchased a larger piece several inches cross and carefully snipped it apart. I added these four pieces and then added some white shiny beads as accents. Ribbon embroidery was up next. I have dabbled in this many years ago and enjoyed that a few quick stitches resulted in a beautiful flower. French knots and detached chains made these cute little flowers. If you look carefully, you can see the beads that I added to the middle of the lace motif. i was quite surprised at how well the iris turned out. They still look sort of like bunnies with droopy ears, but they make me smile. Detached chain with a twisty droopy loop underneath and then stab stitch for the leaves. Woven roses were lots of fun. I practised on another piece first and made them a bit larger here. I could have put them a wee bit closer together, though I did use leaves to fill in some of the extra space. There is still a big gap that needs more flowers and a twisting vine, but first I have to hem daughter's prom dress. Fortunately I have a rolled hem foot for one of my machines. I'll be practising on the part i cut off before moving to the garment. Of course, the lovely three inch swath I trimmed off the bottom has been set aside for a future project. In fact, I have asked daughter's friends to send me the bits from the bottoms of their dresses so that i can make them some small wall hangings to remember their proms. I'm thinking a small fan with stitches along the blades and then applique that to a pretty background. Small enough they can pin it up in their dorm rooms in the fall. Did you daughter have trimmings from her prom dress? What did you do with them? 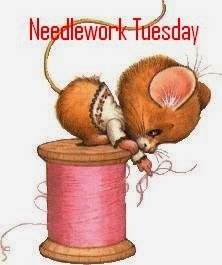 Mr. Linky is waiting below for a link to your current needlework post. Also leave a comment and I'll be sure to visit with you. Gorgeous work, Heather!!! I love your ribbon embroidery, especially the roses. The whole crazy block is stunning! I love your idea about the prom dress cut-offs. What a lovely reminder of an important event. It's beautiful Heather, I love Crazy Quilts but no way have the time or patience!